Yes! You read that correctly… Dairy Free Chocolate Thickshake is what I am sharing with you today. My version is full of healthy ingredients and will make for a great snack or breakfast. No need to go buy one of those highly processed and refined sugar laden versions ever again! 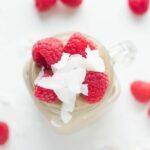 This Dairy Free Chocolate Thickshake is not only dairy free, but it is also gluten and refined sugar free, and suitable for both paleo and vegan lifestyles. It is super simple to whip up, but make sure your banana is frozen, otherwise, it will be more like a smoothie.